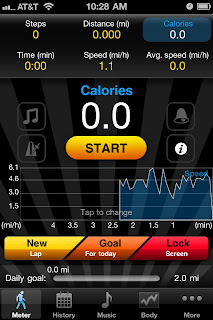 Mondo Samu: APP REVIEW: iTreadmill VS. All-In Pedometer…FIGHT! Well, I've reviewed all of the iPhone apps I use in my morning routine, but I haven't yet written about another app I use on a daily basis. 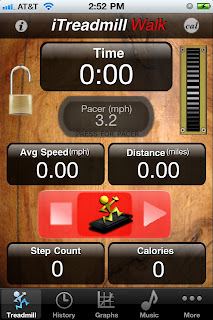 iTreadmill by Ricky Amano, and my wife's preferred pedometer All-In Pedometer by Arawella Corporation. When I first started walking, I was already using LoseIt! to track my calories, so I wanted to make sure I used a pedometer to track how many I burned when walking. I started experimenting with various pedometer apps and, really - to be honest, they're all pretty much the same thing. 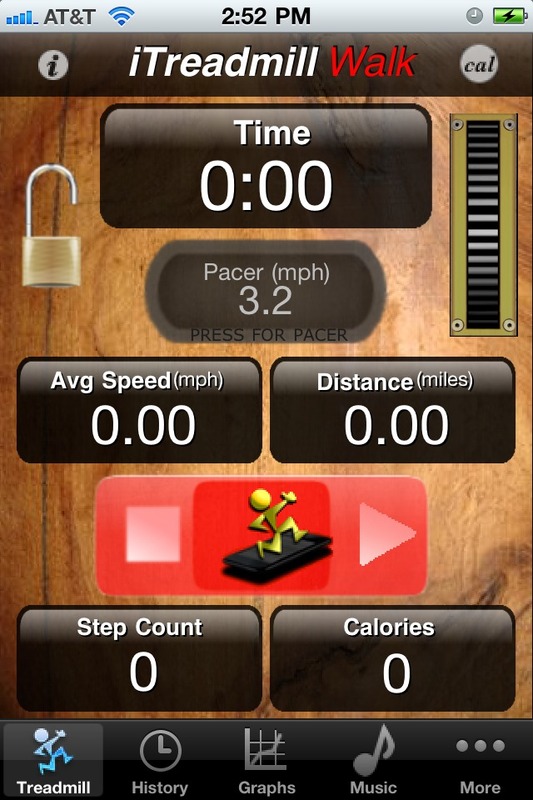 Pretty much all the pedometer apps out there have a walking screen, a music player screen, a settings screen and a graphing or history screen. Some are ugly, some are very nice looking, but in my trials there were two that rose to the top. Since all of them have very similar characteristics, let me say that I am not going to focus on those things. Both play music well, both have similar settings, both have very detailed history. So instead of discussing the obvious, let's talk about what makes these two so good, and what makes them different from one another! ~ Usability - Interface design is critical in something like this. All-in - Requires calibration. This one is extremely accurate, but only when used in very specific locations on the body. There's a whole explanation about why it matters and where to best locate the device to get the most accurate information. If you follow the recommendations, this app has extremely accurate info. If you don't, you'll end up with bad data plus or minus. Bad data doesn't do anyone any favors. But, again, if used as recommended, you can't beat it. iTreadmill - This app somehow does not require calibration, or more accurately, seems to do it on it's own and does so very effectively. If you set the sensor to "Auto" it will quickly and constantly adjust to your stride, pace and so forth. It is extremely accurate, and never has to be re-calibrated. No matter where you wear it, it just WORKS! If you want good accuracy with simple management, this one is great. Results: iTreadmill wins round one on a technicality. They are both extremely accurate, but iTreadmill requires less intervention and placement isn't an issue. iTreadmill wins! All-In - With a beautiful interface that is "apple-slick", the All-In Pedometer is really nice looking slick. The only issue I have with it is that while it looks very serious and slick, it is a little busy for what you need when walking, and that frenetic interface uses up valuable real estate that would be better served with bigger buttons. iTreadmill - While a little "immature" looking graphically, the iTreadmill interface has nice big buttons and is well thought out for it's purpose. If you prefer function over form, iTreadmill is a no-brainer. 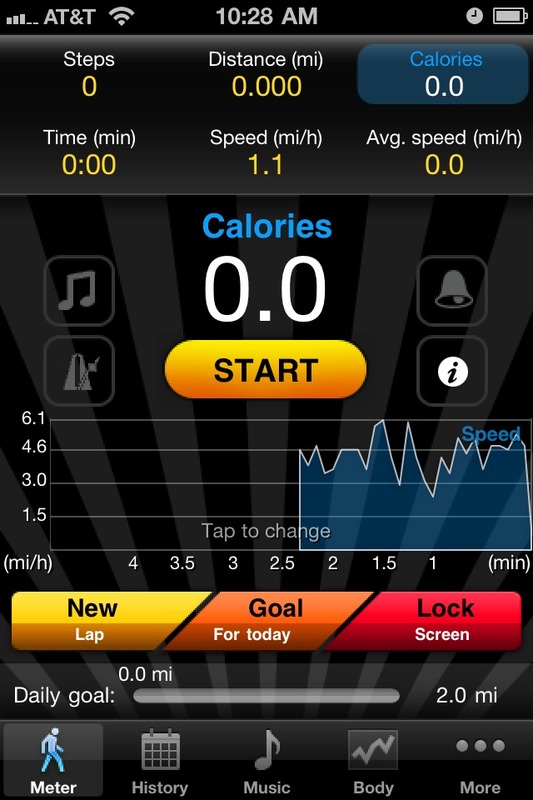 You can change the metrics that are displayed just by tapping on each button. They cycle through and allow you to quickly customize the interface. It has large, VCR style buttons that are very thoughtfully sized and located. It also automates a lot, such as auto-pause, which is VERY nice and prevents your times from being too far off if you make a few stops. Results: A tie between the two! All-In Pedometer looks better but the buttons are smallish. iTreadmill is not nearly as slick looking, but easily has the superior design for functionality. So with one round tied and the other going to iTreadmill, I'm reporting that iTreadmill is the winner and superior product. I use it daily and highly recommend it. Go get it! Let me know if you have any questions. I have used both and my wife uses All-in, while I prefer iTreadmill. Wonderful week of mindful fun! You get what you get, and you don't get upset!